The zoo was forced to pay €5,000 to charity after the attack. A CHILD ATTACKED by a tapir in Dublin Zoo is lucky not to have caught an infection, a report by the doctors who treated her says. The two-year-old was put in a serious condition when she was attacked by the normally docile animal last August. The young girl was part of a supervised visit to the animal’s enclosure at the zoo. 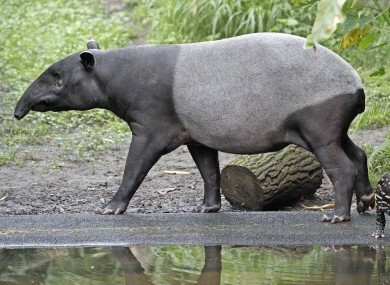 It is believed that the tapir became agitated and attacked the child, leaving her with deep cuts on her arm and stomach. She underwent surgery in Temple Street Children’s Hospital. In this month’s Irish Medical Journal, the doctors who treated present the case as an unusual example of trauma in children. They say that the child “was bitten, held to the ground and shaken”, leaving the child with deep cuts on her arms, head and in her stomach. She needed to have her appendix removed. The zoo was ordered to pay €5,000 to charity because of the attack. In the discussion section in the report, the doctors say that the young girl was lucky to avoid infection. to sustain more severe injuries (75% of fatalities from animal bites are children). Children are also more likely to suffer multiple injuries. Email “Toddler attacked by tapir in Dublin Zoo 'lucky not to be infected'”. Feedback on “Toddler attacked by tapir in Dublin Zoo 'lucky not to be infected'”.